Learn about the connection between handwriting, reading and writing skills. Our pilot program research shows the importance of teaching handwriting and how handwriting relates to other curriculum areas. Learn why handwriting is still important in our technology rich environment. The ez Write Program was piloted at ISD 728 – Lincoln Elementary in Elk River, Minnesota from 2006-2010 and is a proven, research based program. 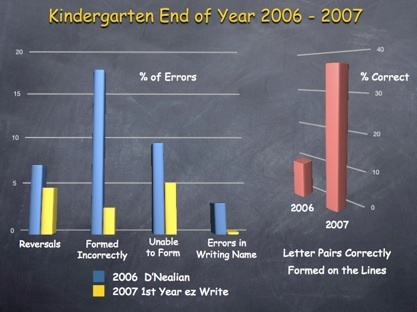 This chart compares the % of errors for the 2006 end of the year D’Nealian Students and the 2007 ez Write students. The red chart shows how many correctly formed pairs of letters each class had. There was a marked difference in the neatness of the ez Write students handwriting. This beginning dot outline font was implemented in 2008 and is now used on the worksheets from preschool through Second Grade. 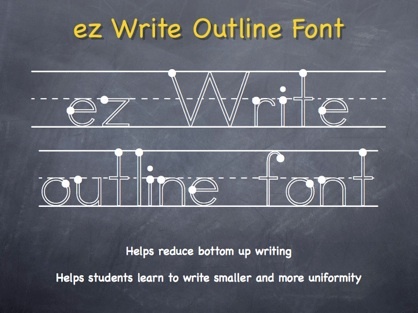 It helps reduce bottom up writing and helps students write more uniformly. 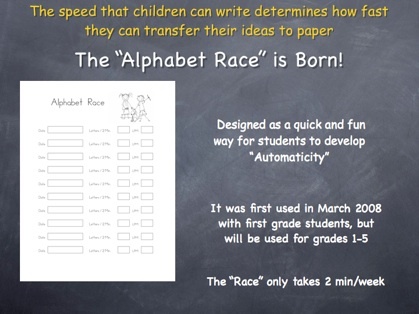 After analyzing the results of the Letter Per Minute rates for Lincoln we designed the “Alphabet Race”. We asked the first grade teachers to do the race once a week until the end of the school year. 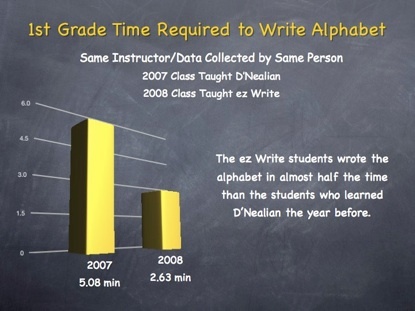 At the end of 2008 school year we tested the first ez Write class and found that they wrote the alphabet almost twice as quickly as the D’Nealian students the year before. 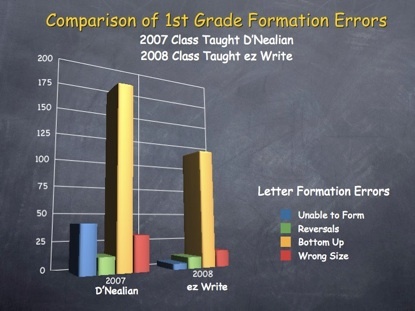 This chart compares the % of errors for the 2007 end of the year D’Nealin 1st grade students and the 2008 ez Write students. We were concerned with how many children were writing from the bottom up, so we designed the starting dot outline font which helps students break their bottom up writing. As we did the pilot program we were constantly studying handwriting research and early on in the pilot we realized the importance of “Automaticity”. 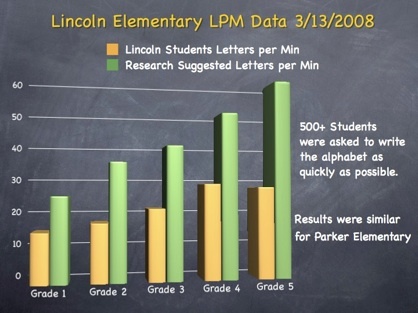 We decided to take samples in all the grades at Lincoln and Parker elementary to find out what the letter per minute rate was for each class. See results above. The results were very encouraging. 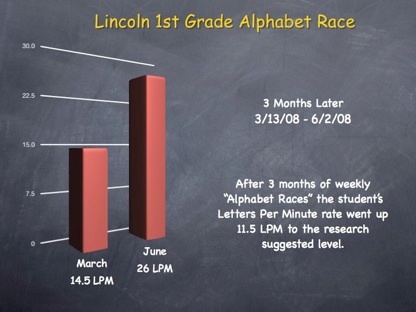 After just 3 months of weekly “Alphabet Races” the student’s letters per minute rate went up 11.5 LPM to the research suggested level. A year later we checked the 2nd grade ez Write students LPM and found that they were writing faster then the 5th grade students did in 2008. 2nd Grade Test Study. Results of 10-week handwriting intervention with 2nd grade students using ez Write. This study measured impact of ez Write and direct writing instruction on handwriting speed, composition and text generation, oral reading fluency, and computational ability. Click here to view. 1st Grade Test Study. Results of 10-week handwriting intervention with 1st grade students using ez Write. 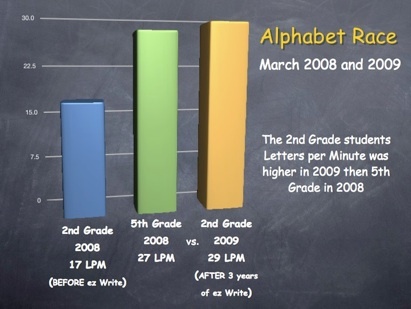 This study measured impact of ez Write instruction on handwriting speed and improvement in. Click here to view. THE CHANGE IN THE AMOUNT OF TIME TEACHERS SPEND TEACHING HANDWRITING IN THE LAST 50 YEARS IS HUGE!! TODAY THE AVERAGE IS LESS THEN 10 MIN. OR IS NOT TAUGHT AT ALL IN MANY CLASSROOMS OR TEACHER COLLEGES.